The south west of Scotland has some of the best sea trout fishing rivers in the country. 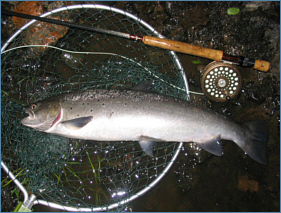 Rivers like the Border Esk, Nith and Annan have some of the most attractive beats for night fishing and can provide excellent sport with sea trout through the summer months, before the main runs of salmon appear in the autumn. Permits are available at reasonable cost on a wide variety of beats, on association waters, hotel beats and private estates, although it has to be said that the last few years has seen a worrying dip in the numbers of sea trout caught. The map below shows the main sea trout rivers in southern Scotland. The famous River Tweed flows eastward to enter the North Sea at Berwick; the Nith, Annan and Esk southwards into the Solway Firth. Clicking on a green dot will take you to a page showing detailed maps of each sea trout river with additional information on the sea trout fishing available on the rivers in the south of Scotland. 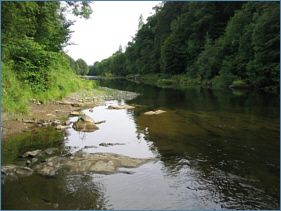 For more information on the excellent sea trout fishing available on the southern Scottish rivers, including detailed maps, please select a sea trout river by clicking on a green dot on the map or on a river name in the list to the right of the map.